We’re back! Here’s hoping your Thanksgiving holidays were as filled with food, family and football as ours, and that you passed through the gauntlet of various Black Fridays, Cyber Mondays, Giving Tuesdays, and other assaults on your wallet relatively unscathed. Now it’s back to work, and back to the ever-changing, never-dull world of healthcare! Only a precious few weeks left in 2018…let’s take a look at what’s going on. Nearly a year after first announcing its intention to acquire the health insurer, this week pharmacy retailer CVS closed its $70B takeover of Aetna…almost. In a press release issued Wednesday, CVS CEO Larry Merlo said, “Today marks the start of a new day in health care and a transformative moment for our company and our industry.” The pharmacy giant reaffirmed plans to launch “foundational pieces of its new care model” across the coming year, alluding to its planned “Health Hub” pilot stores revealed earlier this month. Speaking at the Forbes Healthcare Summit this week, Merlo urged CVS customers to “think of the store evolving toward a healthcare destination”, in which pharmacists would come out from behind the counter and serve as health advisors, assisting in managing consumers’ health. Before that can happen, however, the deal will need to clear one additional, unexpected hurdle. On Thursday, US District Court Judge Richard Leon raised the prospect of not approving the acquisition, objecting to being treated as a “rubber stamp” in the midst of what otherwise would have been a routine legal proceeding. Although the deal passed Department of Justice muster, and all of the state regulatory hurdles it faced, agreements between the Federal government and merging companies are required to be approved by the D.C. District Court, where Judge Leon serves. By the end of the week, it was unclear when final approval might be forthcoming, although Judge Leon set another hearing for the deal next Monday. Meanwhile, perhaps in reaction to prospect of competing with the newly-merged CVS-Aetna, Stefano Passina, CEO of pharmacy retailer Walgreens, said at the same Forbes event that his company is in discussions with health insurer Humana to extend their partnership—possibly in the form of a joint venture. The two companies have been jointly developing senior care clinics in the Kansas City market since June, and just before Thanksgiving the Wall Street Journal reported that the firms were in “preliminary discussions” to take equity stakes in one another. That’s a significant step beyond the scope of the relationship described by Humana CEO Bruce Broussard back in August, when he compared the Walgreens collaboration as “smaller clinics” as compared with Humana’s broader, longer-standing partnership with retail behemoth Walmart. Earlier this year, Walmart was rumored to be in takeover talks with Humana. With all these permutations and combinations of retailers, insurers and pharmacies, and with Amazon looming ever larger in the background, it’s clear that the CVS-Aetna deal is just the first of many transformative changes to come in healthcare. As we’ve been emphasizing in our work this year, a fundamental realignment is underway, aimed at disrupting high-cost, incumbent providers in favor of more consumer-friendly solutions. All of this should make for a fascinating, if turbulent, 2019. This Thursday, Massachusetts Attorney General Maura Healey signed off on the proposed merger between Boston, MA-based Beth Israel Deaconess Medical Center and Burlington, MA-based Lahey Health, moving the deal past its final regulatory hurdle. The new health system, to be called Beth Israel Lahey Health, will include 13 hospitals and provide about 25 percent of all care in the state. The system will be a close second in share to Partners Healthcare and will provide that system with the first real challenge to its dominance of the eastern Massachusetts market. State approval did not come without significant restrictions. Healey’s office investigated the merger for over a year, and concluded it might raise costs and reduce competition and access, particularly for lower-income residents. Rather than block the deal, however, the state chose to negotiate a settlement with the systems aimed at preventing these adverse outcomes. Under the agreement, the new health system agreed to cap price growth at three percent per year, saving an estimated $1B in costs over seven years. The system must also “work in good faith” to ensure their doctors accept Medicaid and must produce advertising aimed at increasing the number of Medicaid patients served. These state-imposed restrictions are similar in nature to those recently set as part of California’s approval of the merger of San Francisco, CA-based Dignity Health and Englewood, CO-based Catholic Health Initiatives, under which the new system is required to maintain current levels of emergency care and women’s health services, invest $20M to address homelessness, and bolster charity care and financial assistance for low-income patients. As health system consolidation continues, we expect more merger approvals to come with these kinds of conditions attached, a positive sign that states are demanding scale that delivers value for patients and communities. In a development that rocked the science world, Chinese researcher He Jiankui announced that he had created the world’s first genetically-edited human infants. Dr. He reportedly used the gene-editing CRISPR technique to remove a gene for a cell receptor used by the HIV virus to enter cells. Dr. He’s goal was for the twin girls, born last month, to be resistant to HIV infection. The scientific community worldwide responded with alarm, noting the numerous ethical questions in He’s work. Standard gene therapy techniques alter the DNA in somatic (or body) cells, and changes cannot be passed to offspring. Dr. He edited the DNA of germ, or reproductive, cells, meaning that the mutation will enter the gene line and be passed from parent to child. Scientists worry that the noble goal of editing a disease-causing gene could have adverse consequences, or be used to create a lineage that has special capabilities, so-called “designer babies”. It may sound like a work of science fiction, but it’s easy to see how gene editing to improve the strength of muscular dystrophy patients could also be deployed to create a line of athletes with “super-strength”. There are also ethical questions around patient consent. To prove that these infants are actually resistant to HIV infection would require lifelong monitoring at best, or deliberate exposure to the virus at worst. Regulating gene editing worldwide presents a challenge, and members of the scientific community are moving toward an international resolution against the technique. However, one American university has a direct connection to the work. Dr. He did his graduate studies at Rice University in Houston, TX, and his advisor, professor Michael Deem, may have worked on He’s research in China. Rice is opening an investigation into Deem’s involvement, highlighting the need for universities to provide oversight of their faculty’s work beyond the university’s borders when there is a question of critical ethical issues. This year we’ve had the chance to work with a number of health systems looking to reinvigorate their strategic planning processes. As we’ve shared before, our view is that too many organizations take an “asset-driven” approach to planning, rather than a “value-driven” approach. Strategic planning often comes down to capital planning, and the typical exercise is often just a matter of choosing which buildings to build and which investments to fund. We’ve urged our clients to take a consumer-oriented approach to planning, starting by asking what consumers need and working backward to what services, programs and facilities are required to meet those needs. That’s led us to adopt a “functional” view of the health system, breaking the enterprise into component parts that perform different “jobs” for the people they serve. 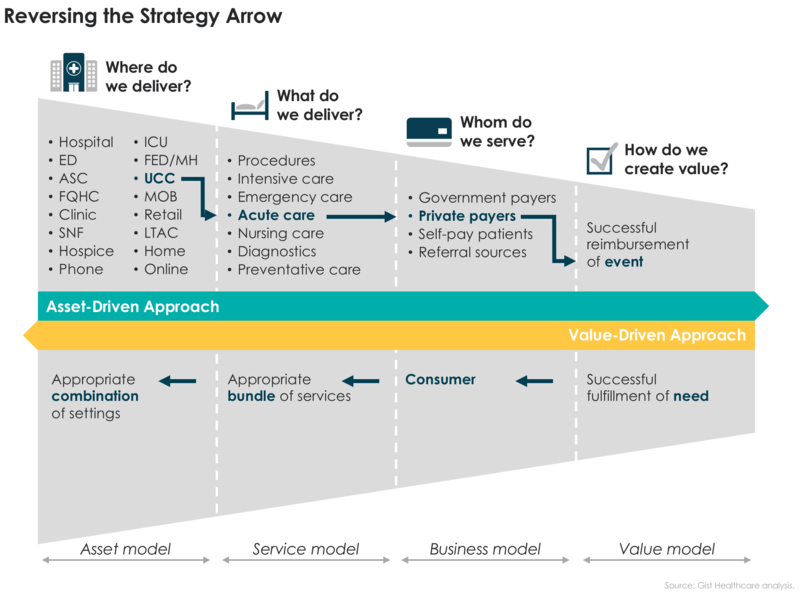 Combined with our perspective that much of the work of the traditional hospital can be pulled “up or out”—either “up” into regional or national centers of excellence or “out” into lower-acuity, lower-cost settings across the continuum of care—this functional approach led us to create the graphic below. Over the next few weeks, we’ll use this space to unpack this (admittedly dense) graphic piece-by-piece. Briefly, for now, note that we’ve described the health system as a collection of three local delivery businesses that are powered by functional support from the regional and national levels(though the latter two layers are often collapsed into one for systems operating only in one region). There is the “access business”: a front-end collection of delivery capabilities that serve as the entry point into the system, and might include retail clinics, urgent care clinics, physician offices, and other outpatient services). On the opposite end, there is the “postacute business”, which (given whom it often serves) might also be called the “senior care business”: skilled nursing, long-term care, hospice, and so forth. Both of these businesses might be augmented by home-based care (for brevity, we didn’t try to wedge that icon in multiple times). In the middle is the acute care hospital, but note that its role is somewhat diminished given the ability to delivery many of its traditional functions in other settings. As we’ll discuss later, we envision a new, “asset-light” hospital of the future. Helping to slim the profile of the traditional hospital, the “specialty business”, is a regional aggregation that reflects the need to rationalize many specialty services by pulling them out of hospital silos into regional centers of excellence. Locating the specialty business at the regional level emphasizes our view that service line management should mostly take place at a level above the local hospital. 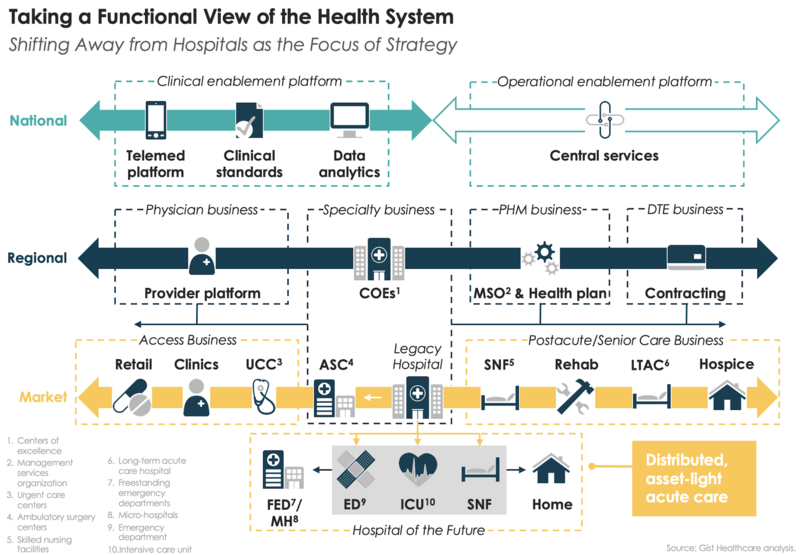 Other functional areas that should similarly be regional “businesses”: the physician platform, governed and managed as a single, integrated entity across the region; the population health platform, coordinating care and information across the regional continuum; and the contracting platform, working to secure “lives” to enable system growth. Meanwhile, at the national (or super-regional, or regional) level are two clusters of “enablement” businesses. First is the “clinical enablement platform”, centralizing all of the system’s clinical capabilities and deploying them in support of value delivery at the market level. This includes telemedicine, clinical standard-setting and best-practice development, and clinical data analytics. The other is the “operational enablement platform”, centralizing back-office functions, setting operational standards, and delivering the value of scale to improve the effectiveness of local care delivery. It’s an eye-test chart if ever there was one, but we’ve found this approach very effective in reframing systems’ thinking around planning and investment strategies. Starting next week, we’ll take a stepwise approach through the graphic, highlighting how each area is constructed and sharing our perspective on future evolution. We recently spent a day with the executive team of health system I’ve advised (and admired) for nearly a decade, sharing our thinking around the scale required to manage risk and build a consumer-focused health system, and helping them evaluate potential merger partners. This organization is among the small number of systems who have not only developed capabilities to succeed under risk-based payment but also actively worked to move their market to value. Dominant in their metropolitan area, they have built a very successful Next-Generation Medicare ACO and struck several commercial risk contracts. Despite their success, their CEO has concerns about the system’s ability to continue the move toward value. Today the system has just over half of its revenue under risk, but they’ve hit a wall in moving remaining contracts to risk. Unrewarded demand destruction as well as growing capital needs have led this independent-minded system to question for the first time whether or not they need to find a partner—but when they look at the regional health systems around them, they’re underwhelmed. Other than capital, it’s not clear what capabilities many of their suitors would bring to the table, and there is a real chance that some partners would want to dial back this system’s commitment to move toward risk. Their situation is not unique. We’ve identified a common set of challenges among smaller ($1.5 to $4B) market-dominant systems—successful locally but reaching their limits to innovate on their own. When they look for a health system partner, they feel they are more capable than the larger systems in their region who might be logical candidates for a merger.Working with a few of these vanguard systems, we are helping them undertake a more expansive and critical evaluation of partnership. This begins with defining the capabilities they hope a merger or affiliation will bring, and then considering a much broader range of potential partners. Can one partner satisfy a critical number of needs, or would multiple relationships prove more successful? Is a like-minded regional health system the best option, or should the list be expanded to include national systems, health plans, or other disruptors? We are looking to bring these systems together with other progressive, smaller systems facing similar challenges—if you would like to share ideas, please let us know. Recently we had the opportunity to participate in the annual physician retreat of a large regional health system, where we presented our perspective on the future of the industry and implications for doctors and facilitated a panel discussion among some of the system’s physician leaders. Retreat attendees included health system executives, hospital executives, clinical leaders from the employed medical group, and a number of key independent doctors who are closely aligned with the system. Physician engagement features prominently in this system’s strategic plan, and indeed the system has chosen to position themselves in the market as a “physician-centric” enterprise, aiming to be a destination system of choice for doctors in the region. That focus is driven in large part by the urgent need for the system to grow: they currently lag in their market, finding themselves in fourth place behind an academic system, a for-profit chain, and another community hospital system. While overall market growth has lifted the fortunes of all providers in the area, none of the system’s service areas are keeping pace with market growth, indicating that they’re losing share to competitors. At the heart of the problem: a history of uneasy physician relationships and a variable track record on clinical and service quality. In short, claiming to be a physician-centric system is, for this organization, more aspiration than reality. Preparing for the retreat, we were interested (and a little nervous) to see what the tone of the event would be—how would the system CEO and other leaders navigate the somewhat testy situation? Refreshingly, it became clear from the outset that the CEO had no intention of sugar-coating the truth. Other leaders might have leaned heavily on high-minded rhetoric and feel-good nostrums. We’ve seen a lot of that: talking up “mindfulness” and “work-life balance” are recent favorites among executives looking to paper over difficult discussions. But this CEO seemed unafraid to lay bare the sins of the organization, admitting that “we haven’t done nearly as well as we should have” and that “we can’t settle for this kind of performance anymore.” It was a risk, to be sure, but the frank talk (which at times went deep on some painful issues and experiences) seemed to elicit appreciation and engagement from the assembled doctors. After a day of dialogue that was honestly one of the heaviest we’ve seen for a get-away retreat, we left with the sense that the system was well on its way to resetting the relationship with its doctors. It was a useful reminder that sometimes the best approach is simple, straightforward truth-telling—treating physicians like adult partners rather than hothouse flowers. “Investing in wellness doesn’t just help patients, it also makes good business sense, health care executives said Wednesday during the opening keynote session of the 2018 U.S. News Healthcare of Tomorrow conference in the nation’s capital [moderated by Chas Roades of Gist Healthcare]. It’s a familiar feeling: you find out that a beloved novel is being turned into a movie (or, in the Golden Age of Television in which we currently live, a miniseries), you anticipate the release with excitement, but when you’ve finally seen the adaptation, you’re left with the feeling that something—maybe everything—important has been missed. The translation from page to screen rarely delivers a fully satisfying result. Such was the trepidation with which fans of the stunningly beautiful “Neapolitan Quartet”—a series of Italian novels released between 2012 and 2015—switched on HBO recently to catch the first episode of My Brilliant Friend. What a delightful surprise to discover that the creators have gotten it completely right. If you’ve not read Elena Ferrante’s four Neapolitan novels, we can’t recommend them highly enough—they remain the best reading experience we’ve had in the past decade (and the release of the final installment was the only occasion either of us ever stood in line outside of a bookstore waiting for it to open, the closest we’ve come to Potter-esque fandom). Ferrante, a pseudonymous Italian writer whose true identity has become the object of a favorite literary guessing game, tells the story of two close female friends coming of age and living intertwined lives in postwar Naples, exploring their complex attitudes toward friendship, love, marriage, politics, work, and social class across a 60-year relationship. The novels are now being turned into a 32-episode miniseries coproduced by HBO and Italian studios Rai Fiction and Timvision, and My Brilliant Friend’s 8-episode arc covers the first of the four novels. Spanning the childhood and early adult friendship of the diligent and sensitive Elena Greco and the precocious and enigmatic Lila Cerullo as they move from playground to classroom to workplace to wedding aisle in their poor and violent neighborhood, the series captures precisely the atmosphere and emotion of the written work. Breathtakingly so: our first glimpse of Lila, whose preternatural ambition and talent are the beating heart of the novels, is an instant revelation—you recognize her immediately as the child Ferrante described, living in the world you’ve spent so much time reading about. Even the sound of the regional dialect rings true to Ferrante’s work, and the subtitled text hews closely to the excellent translation of her novel by Ann Goldstein. So infrequently are female friendships honestly depicted on screen with nuance and complexity, minus the Hollywood sheen, that the series feels truly groundbreaking. Now four episodes in, we’ve once again rediscovered the meaning of “appointment television”, eagerly awaiting each Sunday’s release. What a treat. We were excited to note the release of a new paper by the Urban Institute this week, since we had the opportunity to assist the authors as they conducted their research. Written by Urban fellows Dr. Bob Berenson and Judy Feder, along with senior research associate Laura Skopec, the piece provides answers to the question, “Why Do Medicare Advantage Plans Have Narrow Networks?” Proceeding from the observation that narrow networks in commercial insurance are often built around preferential steerage to in-network providers in exchange for favorable pricing, the authors wondered what motivates insurers in the Medicare Advantage (MA) space to engage in network narrowing, given that in their earlier work they found that most MA insurers already set rates at or near Medicare fee-for-service levels. Since access to better pricing doesn’t explain why MA plans construct narrow networks, what does? Based on interviews with plans, providers, and industry experts, the authors determined that the ability of narrower hospital and physician networks to deliver lower cost, higher-quality outcomes through better care management is the main factor behind the creation of narrow-network MA plans. In particular, the ability of narrower, integrated networks (often sponsored by a provider organization) to earn higher star ratings from Medicare is a key factor in making narrow MA networks attractive. The authors also noted that sponsoring a narrow MA plan is financially appealing for provider organizations, who are thus able to gain access to the Medicare premium dollar, allowing them the flexibility better manage patient care. We are strong proponents of models that bring together a Medicare risk model with an integrated delivery approach, such as the ones described by the Urban Institute analysis. As the authors point out, it’s no accident that the only five-star rated MA plans are provider-sponsored plans. With this in mind, we were interested to read this week that Minneapolis, MN-based insurance start-up Bright Health garnered an additional round of $200M of investments to fuel the expansion of its narrow-network, provider-partnership approach to Medicare Advantage. Offering MA plans in Denver, CO, Phoenix, AZ, and Birmingham, AL this year, and adding additional plans in Ohio, Arizona, Tennessee and New York in 2019, Bright Health’s model is to partner with a single provider organization for each of its plans, banking on the ability of a narrowly-scoped, integrated network to deliver better-managed, better-coordinated care. For provider organizations looking to step into the Medicare risk business, partnership with plans like Bright, Oscar, or others may be worth considering as a way to capture the promise of an integrated, risk-bearing model for managing the care of seniors. Few patients would know that the scrub-wearing person in the operating room advising their surgeon on how to use the latest technology is actually a salesman. And yet, device vendors commonly participate in surgical procedures. A recent piece from Kaiser Health News took a comprehensive look at a lingering issue for hospitals: should access of medical device salespeople to surgeons and operating rooms be limited? Medical device companies tout the valuable technical guidance provided by their “reps”, who may have seen new procedures or devices in action many more times than the surgeon performing the procedure. However, research documents the direct conflict between the sales and consigliere roles, highlighting that device manufacturers often instruct their salespeople to push newer, more expensive—and less-tested—devices over older, well-proven ones. Given the recent growth in device-heavy spine and joint replacement surgery, many hospitals have looked to strengthen rules around access of device salespeople to their operating rooms. Most critical is evaluating the vendors’ advisory role, and structuring access to focus on that function, limiting activities designed solely to develop personal relationships. Reps tout their ability to help surgical teams find components in a crowded surgical tray—for this service, do they need to work with the surgeon, or should they be partnered with OR staff? Hospitals should quickly train staff to fill that role, eliminating the need to have reps attend scores of procedures. Salespeople should be easily identifiable (force them to wear a different, garish scrub color), and prevented from hanging around outside the surgical suite or doctor’s lounge between cases. Moreover, we question whether or not business-major sales reps with little medical background are the best advisors to doctors. If device companies were truly concerned about providing clinical support, they would provide separate, well-trained clinical support staff with no sales responsibilities to serve doctors and patients. During a meeting this fall we were shocked when a cardiologist in an urban market told us that a third of his heart failure patients presenting in the ED routinely test positive for methamphetamines. According to a new piece by Kaiser Health News, his experience is part of a larger nationwide resurgence of the meth epidemic. Meth use surged in the 1990s, fueled by local “labs” cheaply producing the drug from over-the-counter medications containing pseudoephedrine. Use declined after passage of laws limiting the purchase of cold remedies and other medicines often used as a starter source, but a recent study in JAMA showed that methamphetamine-related hospitalizations increased over 370 percent between 2008 and 2015. The upswing in methamphetamine use has been overshadowed by the growing opioid epidemic, although the JAMA study showed that over the seven-year period, hospitalizations due to meth use grew at a faster rate than those related to opioid abuse. Experts attribute meth’s rise to the increased difficulty and expense of accessing opioids, as regulations and prescribing patterns have tightened. Most of today’s meth supply is not being cooked locally but is produced in larger operations south of the border and smuggled into the US. The drug can produce aggressive behavior and hallucinations, prompting many users to present with psychotic symptoms. Hospitals are also seeing an uptick in complications from long-term use, particularly cardiovascular disease, and unlike opioids, there is no drug that can assist in weaning patients off of methamphetamines. Publicly the surge in use “is entirely off the radar”. We have begun to see the results of the intense medical, media and legislative focus on managing the opioid epidemic. The same attention must be applied to resurgent meth use, or we face the challenge of merely swapping one substance abuse crisis for another. Thanks for joining us for this week’s edition. We’re glad to be back—missing even one week of the Weekly Gist leaves us feeling a little sad. We hope you feel the same! If you do, please consider sharing this with a friend or colleague, and encouraging them to subscribe. And thanks again for your continued support, encouragement, and feedback. We love hearing from you! Most importantly, please let us know if there’s anything we can do to assist in your daily work. You’re making healthcare better—we want to help! And for those celebrating across the coming week, Happy Hanukkah!